Last major update issued on January 1, 2016 at 06:50 UT. The geomagnetic field was unsettled to minor storm on December 31. 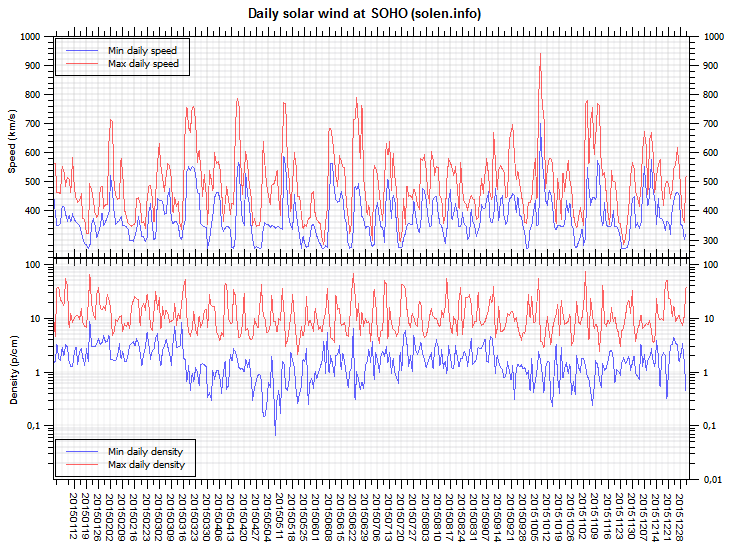 Solar wind speed at SOHO ranged between 322 and 520 km/s. A solar wind shock associated with the CME produced by the December 28 M1 LDE in AR12473 was observed reaching SOHO at 00:10 UT. The total field of the interplanetary magnetic field peaked much later, at 19h UT. 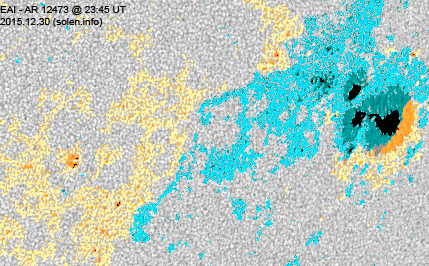 From then and until 05h UT on January 1 the Bz component of the IMF was strongly southwards, eventually causing major storming early on January 1. 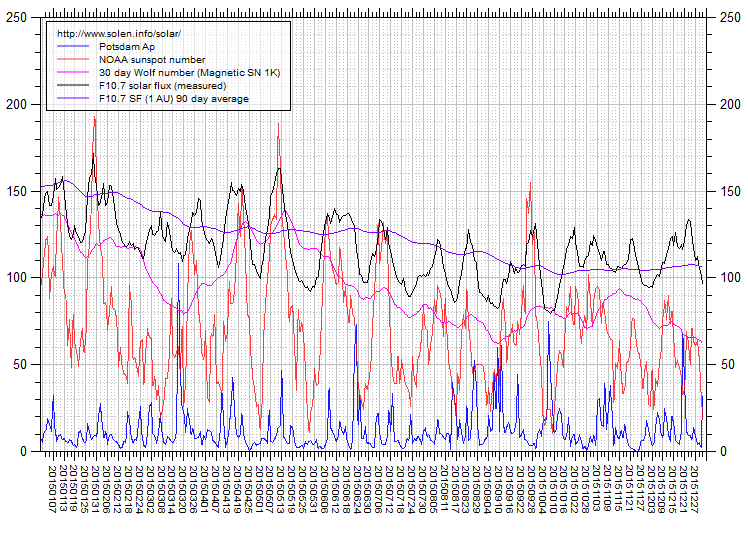 Solar flux at 20h UTC on 2.8 GHz was 96.2 (decreasing 1.4 over the last solar rotation). 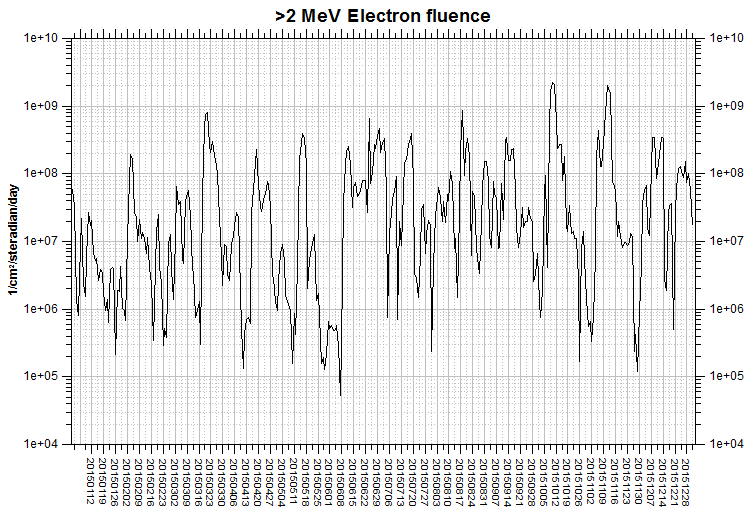 The 90 day 10.7 flux at 1 AU was 106.3. The Potsdam WDC planetary A index was 32 (STAR Ap - based on the mean of three hour interval ap indices: 31.8). Three hour interval K indices: 43345455 (planetary), 33446554 (Boulder). 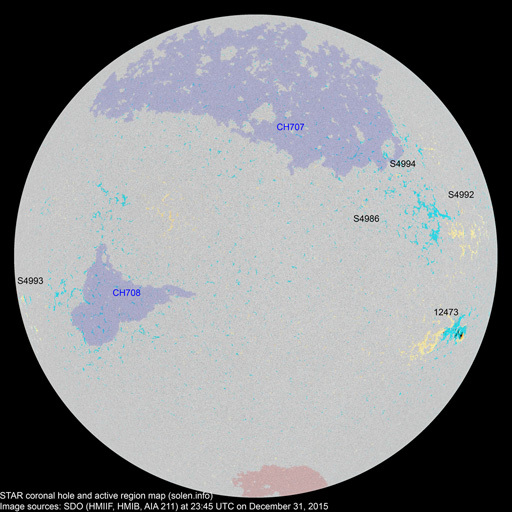 At the time of counting spots (see image time), spots were observed in 5 active regions using 2K resolution (SN: 78) and 2 active regions using 1K resolution (SN: 32) SDO images on the visible solar disk. 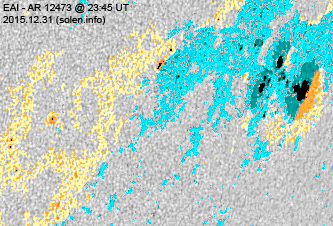 Region 12473 [S21W63] decayed slowly producing a few low level C flares. S4986 [N10W28] reemerged with a tiny spot. New region S4992 [N09W59] emerged with tiny spots. New region S4993 [S11E76] rotated into view with a tiny spot. New region S4994 [N17W38] emerged with tiny spots. 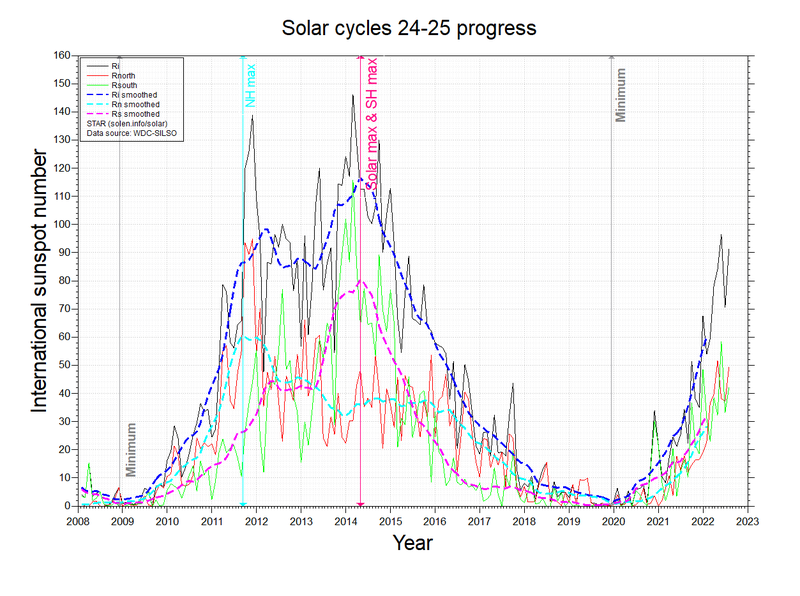 December 29-31: No obviously Earth directed CMEs were observed in available LASCO imagery. A recurrent extension (CH707) of a large northern hemisphere coronal hole was in an Earth facing position on December 29-31. 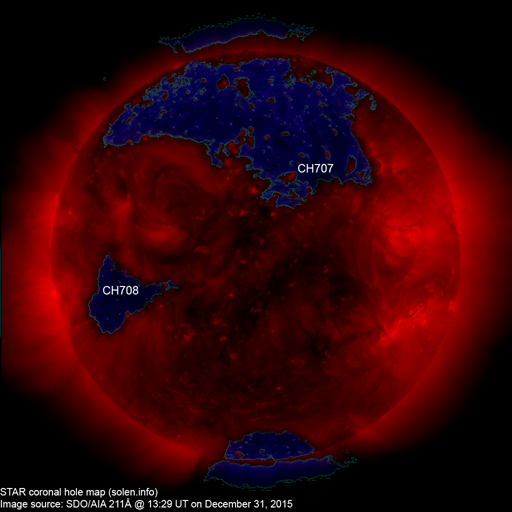 A recurrent southern hemisphere coronal hole (CH708) will be in a potentially geoeffective position on January 2-3. The geomagnetic field is expected to be unsettled to major storm during the first half of January 1 due to CME effects, later on during the day and on January 2-3 unsettled to active is likely due to effects from CH707.